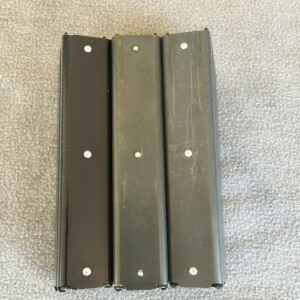 Today we will be covering the subject of AR-180 20 Round Magazines that were original equipment with your rifle. All AR-180’s came with two 20 round magazines when sold new but there are several differences in them that we should know about. 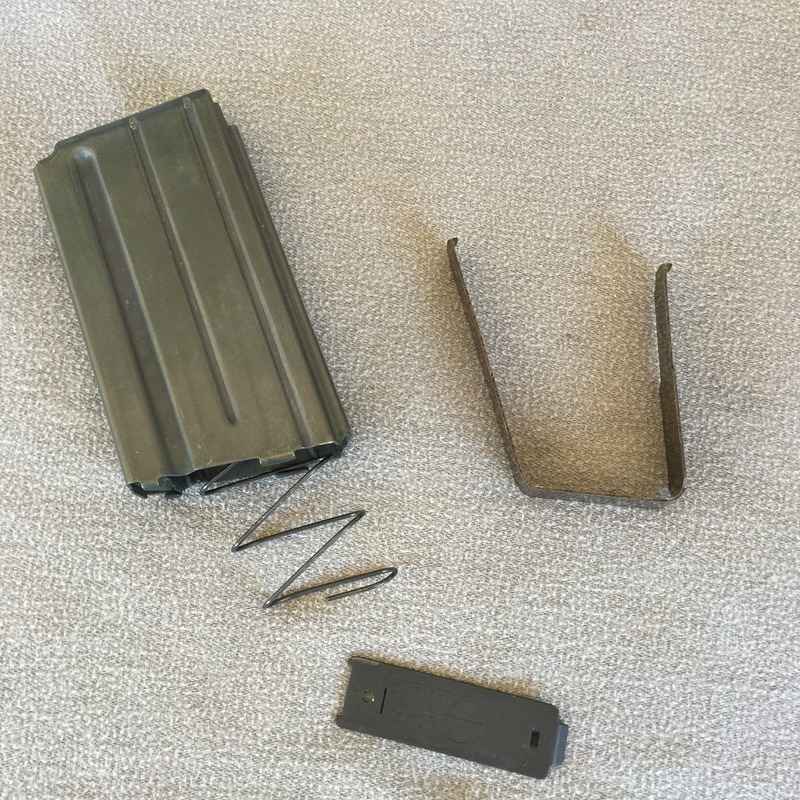 They came with magazines that are very similar to AR-15 mags but with a few important differences. 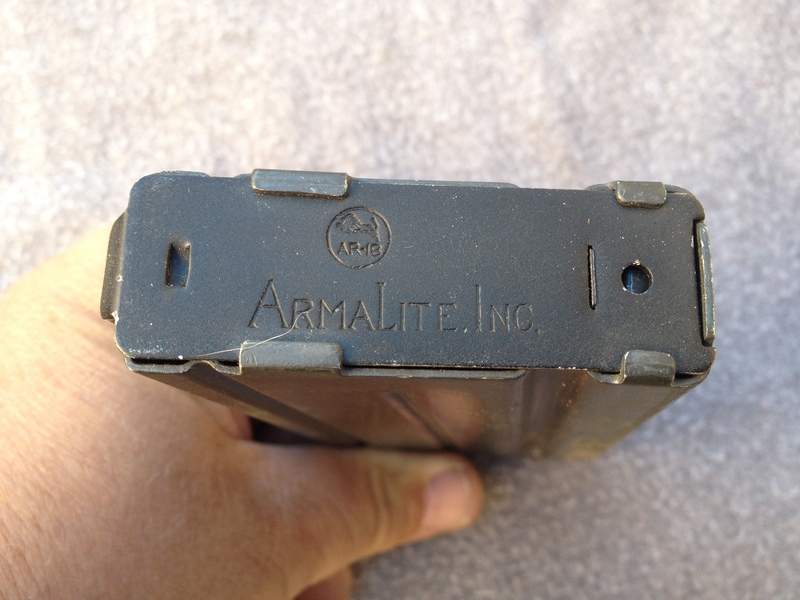 They had no cut-out or dimple on the left side and had floor plates that were marked AR-18. 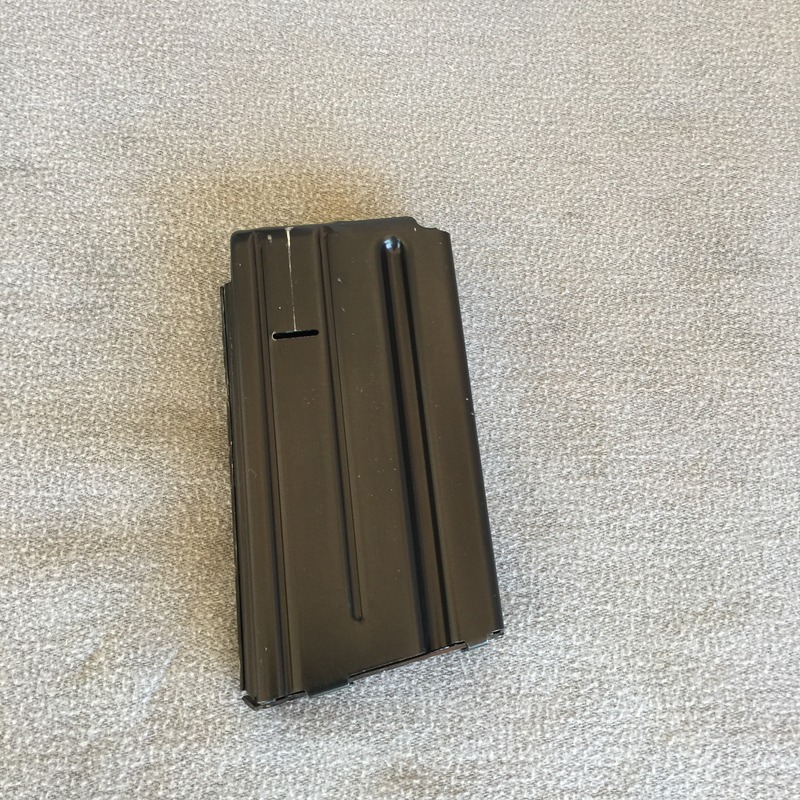 Howa’s came with magazines that were virtually identical but had a different floor plate design. These are the most common ones found today. 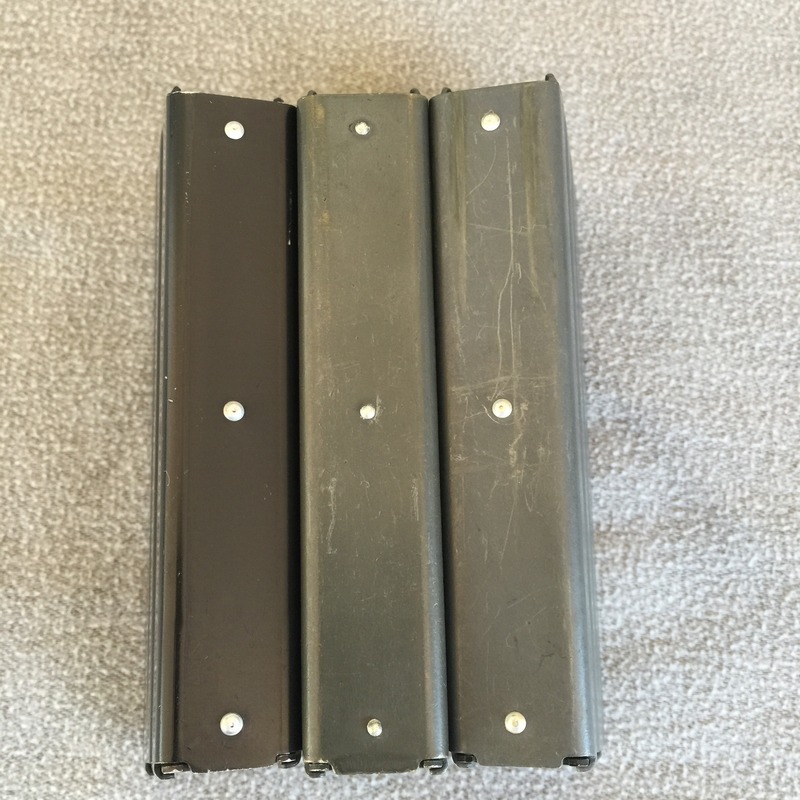 These are generalities and as you will see in the pictures shown below, there are some minor differences even among the 20 round magazines. Many would consider these magazines interchangeable but upon closer inspection we can see they are different and can be identified as early and late. 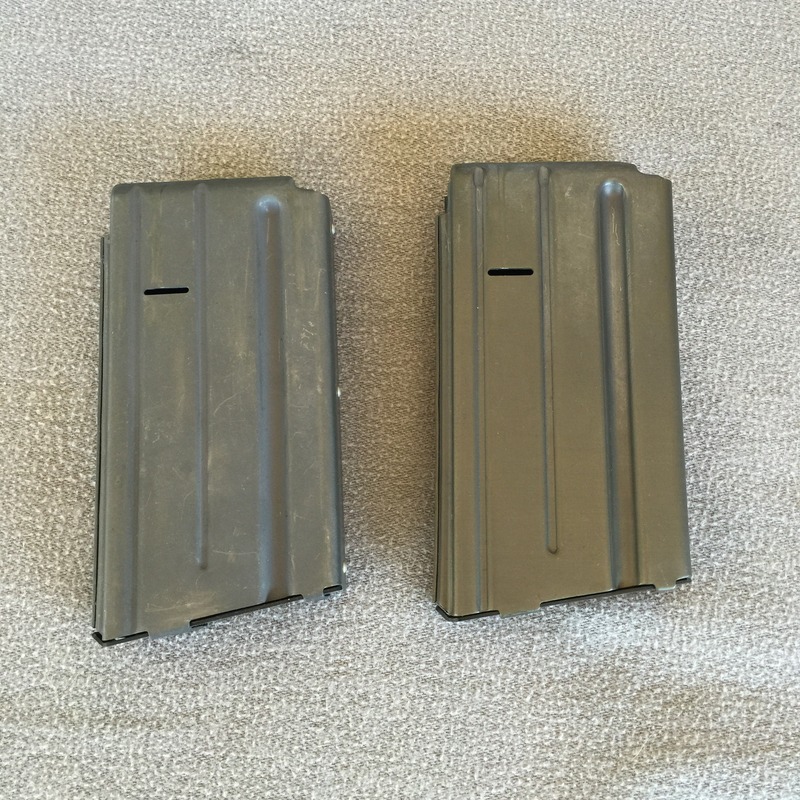 The mag on the right has a green/gray color and is quite smooth. The left one is fully gray and has a rougher texture. 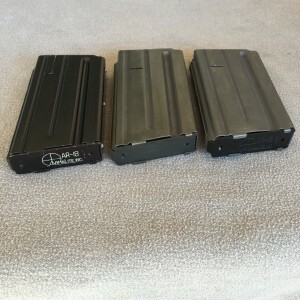 The one on the right is early and is correct for most Costa Mesa rifles, at least the early ones. It will be referred to as early and the other as late. 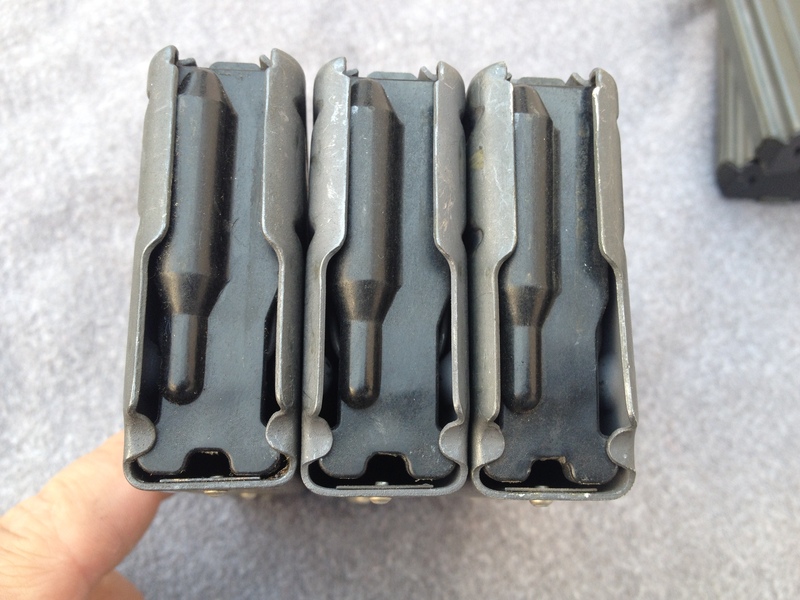 In this picture you can also see that the rivets in the early mag are smaller than the the ones used in the late. Again showing the early mag on the right you can see that the floor plates are different as well. The early plates have a dull finish and the late ones are smooth and shiny. Shown propped on another early magazine. 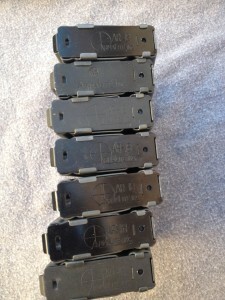 The early magazines came with a device to block them to 5 rounds. This piece is often missing as this was one of the first things people removed after buying their new weapon. I have not been able to determine when these early mags were phased out, we may never know. It is possible they shipped with all the Costa Mesa guns and the later ones went with the Sterlings. 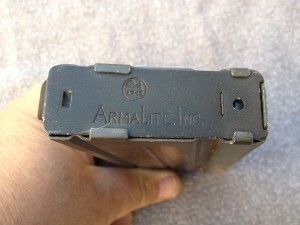 It is also possible that they were only used early on and the later CM guns used the late mags. More research is needed but the ease with which mags can be swapped around may make this an impossible task. 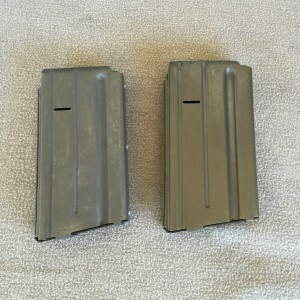 One piece of evidence that may help is the fact that the Howa mags were identical to these except for the floor plate design. 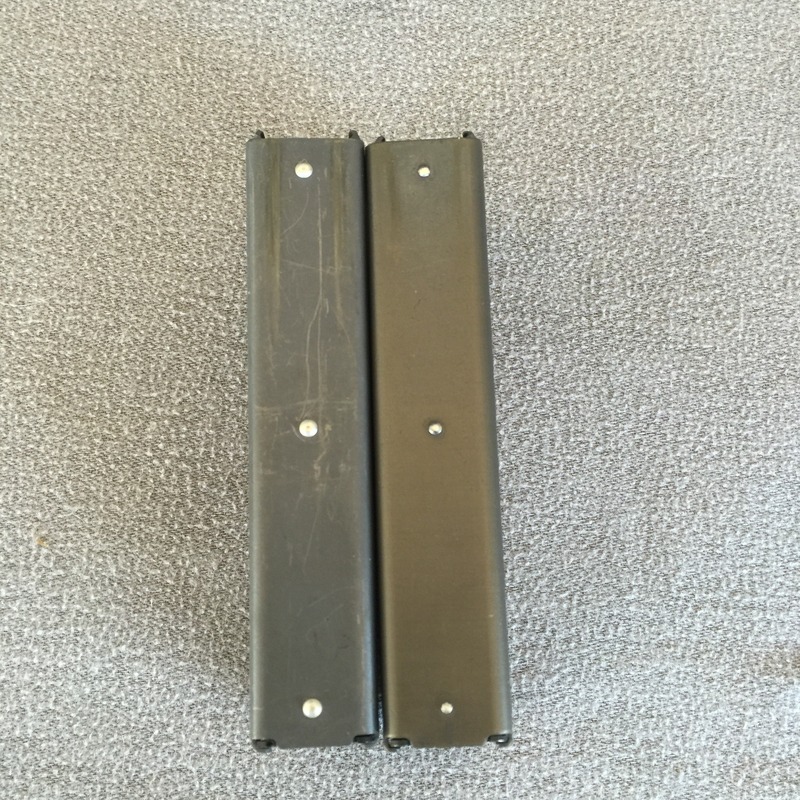 Here is a Howa next to an early mag. 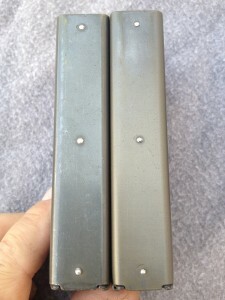 You can plainly see that the rivet is the same and other than the shade being a little off, the color is a close match. Here the floor plate design changes are easy to see. 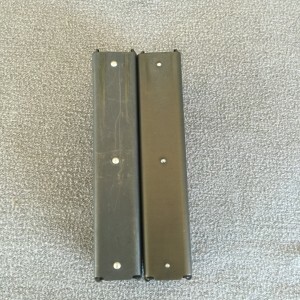 To my mind I believe the mags were made by the same company and in the same time period. That would put the manufacture in the mid 60’s to early 70’s. Lastly we have the easiest to identify, the late Sterling magazine. The Sterling’s were painted black over parkerization till somewhere around the S20,000 serial number. 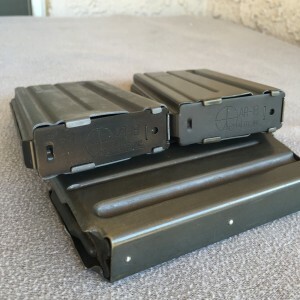 It is my speculation that they used the gray magazines as well as the black during that time and then used the gray during the remaining run of blue finished guns. I have no evidence to back this up. Shown hear next to an early mag with a late one on the far right. 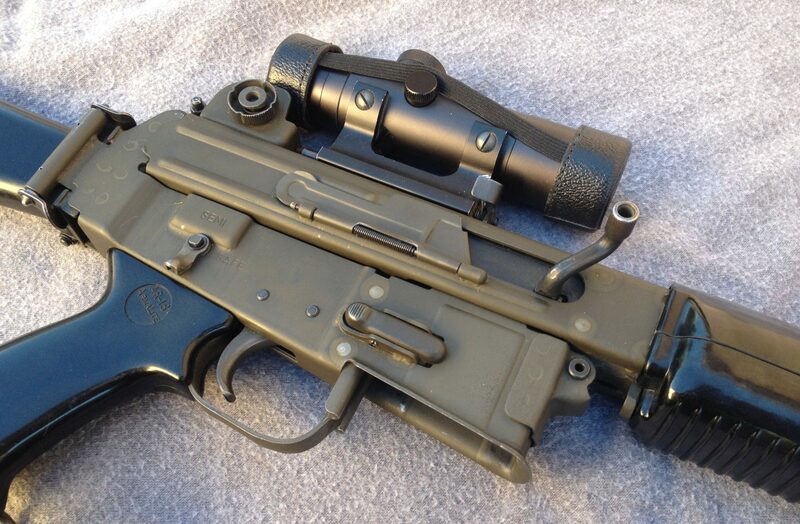 You will note that the rivets are the same as the late mag. The floor plate is also smooth and shiny like the late mag but features a white color fill in the lettering. A better view of the different floor plate designs and finishes. All of these mags used a black plastic follower that has a cut-out for the bolt hold open at the rear. Late gray magazine, Late Costa Mesa? and Sterling. Overwhelmingly the most common. All of the uncommon mags will be hard to find but many of them will be lumped in for sale with the common gray mags and will not be sold at a premium. 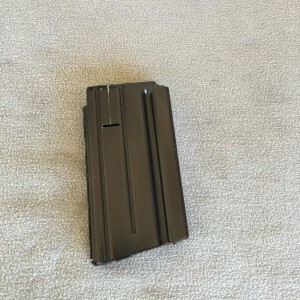 This is not true for the Howa mags however as they are easily identified. I would like to say thank you to Chuck at GunLab.net for the suggestion of this article and the load of original source material he is sending me to further my research and to bring you more articles in the future. Go check out his site, it is a wealth of information. Thanks great write up. Looking forward to a write up on the 30 round magazines. Here are some previous articles on magazines. Both can be found in the November 2014 section.